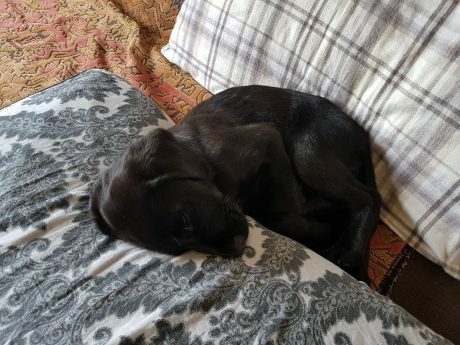 It’s about four weeks after I wrote these words and I am finishing off this update at the table while the puppy in question sleeps, curled up on the settee against The Man. It’s a Saturday: I get a reprieve from full-time Puppy Madness on Saturdays and Sundays. All the news since my last update has been somewhat overshadowed by the arrival of this nibbling, crazy, exhausting bundle of four-legged joy. We spent several weeks trying to decide whether we should get another dog sooner rather than later. Actually, we spent several weeks convincing ourselves that we shouldn’t get a dog because, with other upcoming significant lifestyle changes, it would be a mad thing to do. But, at the end of the day, we kept coming back to the fact that we were both of the opinion that all the hassle and stress would be worth it for that sheer delight having a dog as a member of the family brings. So, we decided in mid-September that there was no point in fooling ourselves, and we should just accept that we were going to do it. Additionally, I had (and still have) several weeks at home on my own allowing us to make some serious inroads in puppy training, and we weren’t sure when either of us was going to get that again. 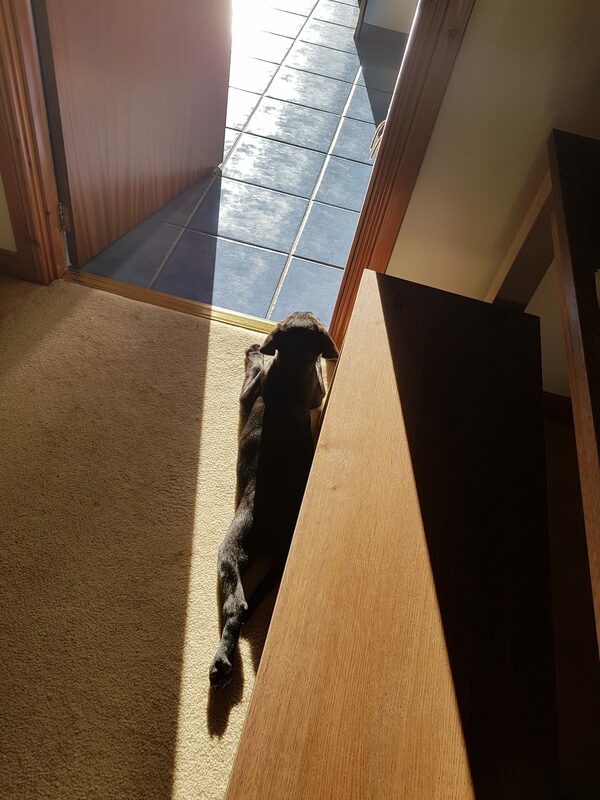 Our puppy is a sun worshipper. As you know, our beloved Osa was a rescue dog, but after much debate we eventually dismissed the idea of a rescue dog this time, simply because it was important that we could train our four-legged friend ourselves, and that he or she would definitely be family-friendly. I was trying to articulate to myself earlier, during another brief, stolen moment of calm, why we choose to do this to ourselves. Invite all this craziness into our lives. But that’s what it’s all about, isn’t it? September also saw me finishing off my PhD by submitting my minor corrections, which were subsequently approved. There are some things that I want to say about the PhD process, as well as blogging about the content of my thesis, so I’m sure that you’ll hear much more about my research over the coming weeks. I had various plans for October, but it took a bit longer than expected to get wheels moving on these. Adjusting to life with Scapa means I’m about a week or four behind the schedule I had set myself, though it also means that, when I get those hours when she’s sleeping, I am so much more productive (especially now she’s sleeping during the day without being surgically attached to me). I’m optimistic about making the progress I wanted to make on various projects before Christmas and, if I don’t, it doesn’t really matter.